Modifying your diagrams from time to time is no longer a drag-- let's take our utilities: sweeper and magnet can help you to modify your diagrams easily. With these two features, you can move diagram elements easily without worrying too much about the layout. 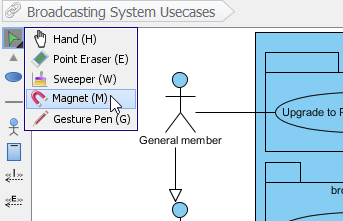 Sweeper can help you to increase more space between the diagram elements while magnet can help you to diminish the space. You will find sweeper and magnet very useful when editing a UML sequence diagram or BPMN business process diagram. 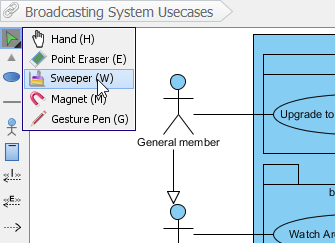 The sweeper is one of the useful features for editing your diagrams. If you have ever experienced of moving the diagram elements without any tools, you probably understand how hard it is to manage the space between the diagram elements. 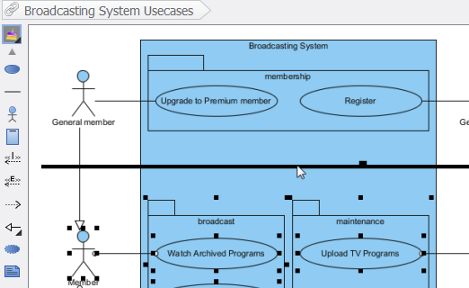 Using sweeper to extend the space between the diagram elements allows you to move your diagram elements conveniently. Click Sweeper button from the diagram toolbar. 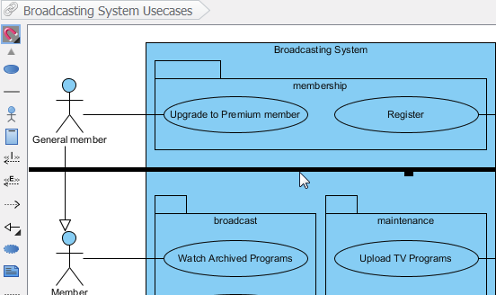 Move the mouse on the diagram pane where you would like to move diagram elements. Hold onto your mouse and move the line horizontally or vertically. Click Magnet button from the diagram toolbar.